MACAO – 14 November 2018 – Conrad Macao, Cotai Central has raised over MOP 168,000 as part of the hotel’s Pink Inspired campaign in support of Hong Kong Cancer Fund’s Pink Revolution and local Macao charity Associação de Feliz Paraíso. As a sponsor of the annual campaign, which increases awareness and funding for its breast cancer care services, the hotel offered guests a series of unique pink experiences and collectibles throughout the month of October. 2018 marked the seventh consecutive year that Conrad Macao donated a portion of its Pink Inspired proceeds to benefit the Hong Kong Cancer Fund’s Pink Revolution’s various breast cancer awareness initiatives. In addition the hotel also donated funds to local Macau charity Associação de Feliz Paraíso which provides respite care to patients in need. As part of the month-long event the hotel turned into a pink palace, with beautiful pink floral arrangements and decorations throughout the hotel and even the hotel’s external lighting turned a shade of pink. Guests could enjoy a range of pink-themed experiences including afternoon teas, pink menus and cooking classes at Dynasty 8 restaurant and spa treatments at Bodhi Spa. They could also participate by making an optional MOP 10 donation to receive a pink ribbon to add to the hotel’s topiary tree. Some of the most popular pink items to buy were the hotel’s iconic bears and rubber ducks in limited edition pink. A highlight of this year’s campaign was the Pink charity lunch, which was held on Oct. 11 at Conrad Macao. Special guests included popular Hong Kong actor and doctor Marcus Kwok as emcee, and founding director of the charity New Sight Eye Care and 2012 winner of the Excellence in Ophthalmology Vision Award Dr. Joyce Samoutou-Wong as guest speaker. Also speaking at the lunch was Sally Lo from the Hong Kong Cancer Fund, who emphasized the prevalence of breast cancer and importance of early detection. Ling Chan, founder of LING skincare also flew in from New York, USA to attend the event. All 300 guests, including members of the International Ladies Club of Macao, dressed in various shades of pink and dined on a special pink themed, three-course menu created by the talented chefs at Conrad Macao, paired with Perrier-Jouët Blason Rosé Champagne. They also enjoyed entertainment and live DJ performances throughout the lunch. Guests were able to purchase lucky draw tickets to win an amazing array of prizes valued at more than MOP 160,000, thanks to the support of many retail partners at Sands Shoppes Macao and others, including Bio Signature Health Beautifying Ltd., Ingrid Millet, La Perla, JK Fitbox, T Galleria by DFS, Ofée, Penhaligon’s and Perrier-Jouët Blason Rosé Champagne courtesy of Seapower Trading Co., Ltd. Prizes also included luxury hotel getaways at Conrad hotels around the world. Every guest also received a gift bag with gifts and special vouchers from retailers at Sands Shoppes including LING New York Spa, John Masters Organics, Ingrid Millet, Lo Hong Ka, Iridium Spa and The St. Regis Bar at The St. Regis Macao, Cotai Central and Bene Italian Kitchen at Sheraton Grand Macao Hotel, Cotai Central. “Every year we are overwhelmed by the generosity of our guests and customers, as well as the commitment of our brilliant team members who help to make the Pink Inspired campaign so successful, and this year is no different,” said Mao Miyazawa, General Manager, Conrad Macao, Cotai Central. “We are also extremely grateful to many of the luxury retailers at Sands Shoppes as well as our sister hotels around the world for their generous support of our Pink Inspired charity lunch, and the invaluable help of the International Ladies’ Club. Social media was also key in the success of this year’s event, with the Pink Inspired campaign reaching around 58,000 Facebook fans through Conrad Macao’s Facebook page. For more information on Conrad Macao’s Pink Inspired Campaign follow us on facebook.com/conradmacao and instagram.com/conradmacao or visit Conrad Macao, Cotai Central website. 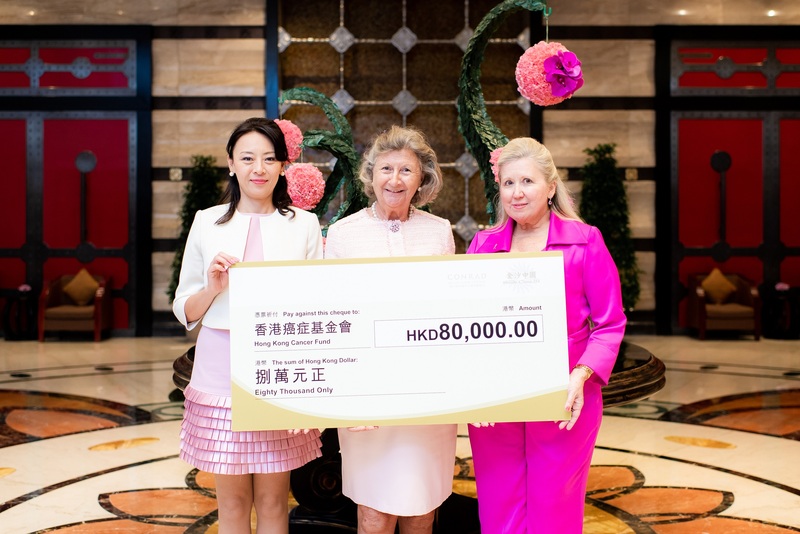 Photo caption: Mao Miyazawa, General Manager, Conrad Macao, Cotai Central (left) and Donna Campbell, Executive Director, Public Relations, Sands China Ltd. (right), present the cheque to Hong Kong Cancer Fund Founder and Chief Executive Sally Lo at Conrad Macao hotel lobby. Conrad Hotels & Resorts is the destination for the new generation of smart luxury travelers for whom life, business, and pleasure seamlessly intersect. Conrad offers its guests an innovative way to Stay Inspired through a curated collection of one, three, or five-hour experiences, available through www.StayInspired.com or through the intuitive digital Conrad Concierge app. Consisting of 26 properties across five continents, Conrad is part of Hilton Worldwide, a leading global hospitality company. Learn more about the brand by visiting http://news.conradhotels.com or follow us on Facebook, Instagram and Twitter.